Here’s the GX6000 I began testing in June photographed at the same time I grabbed the Garmin 742 screen at top. Note the realistic bearings and distances for vessels like S/Y Angel and Snow Star. This evidence that the radio was properly decoding AIS signals even while both Garmin and Raymarine MFDs showed screwy target positions strongly indicated that NMEA 2000 translation was the problem, though I did not know for sure that it wasn’t caused by some wackiness on Gizmo’s complicated N2K network when I reported the issue to Standard Horizon. They didn’t seem to know either, at least at first, but a few weeks later they sent an update for testing. 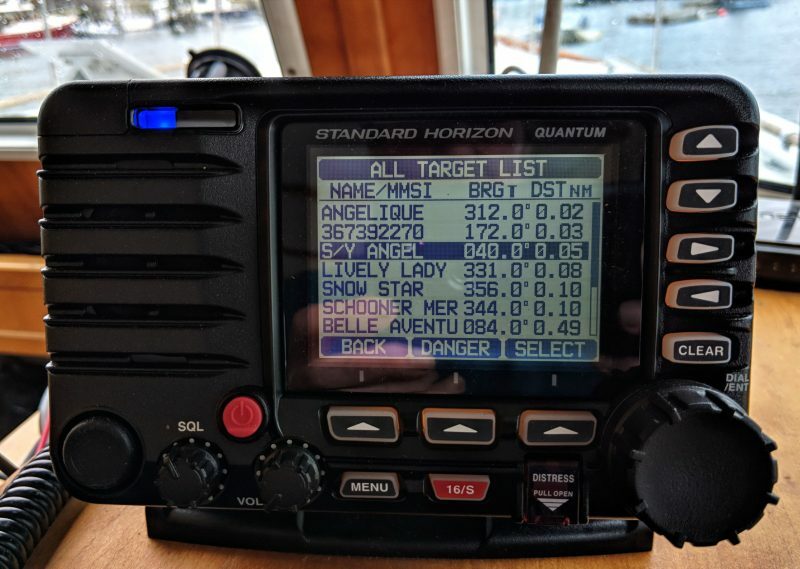 I once updated a Simrad RS35 VHF/AISrx radio over N2K using an SD card and a Simrad MFD, but marine radios are not usually upgradeable in the field, and the Standard Horizon process is easily the most sophisticated I know of. 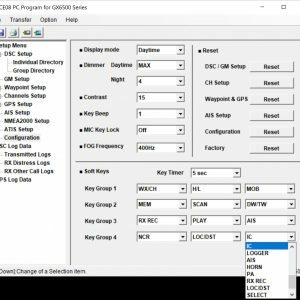 You do need to link a Windows PC to the GX6000’s USB port and download the firmware updates and the YCE08 software found under the Files tab at SH’s GX6000 web page, but then the possibilities even get fun. 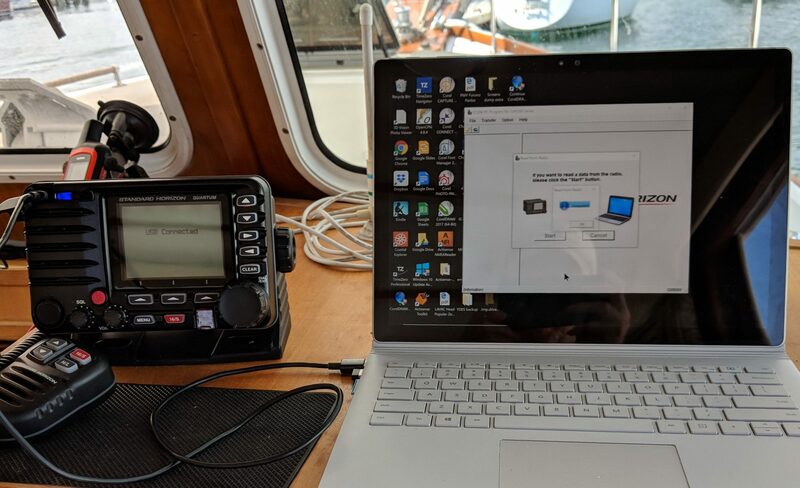 So the top two images illustrate the update process, which did indeed fix the GX6000’s NMEA 2000 AIS output so that targets now display correctly on Gizmo’s Garmin and Raymarine MFDs. 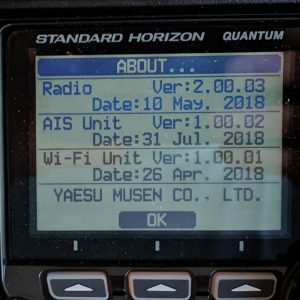 I don’t know what V2.00.03 Radio update did — and it would be nice if Standard Horizon was more informative about releasing new updates and what they do — but maybe I’ll notice in further testing. 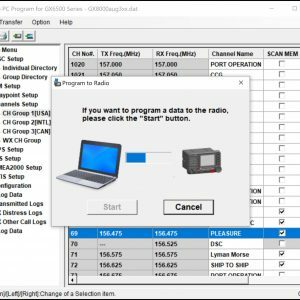 And now the fun part: As shown on the lower screens, the YCE software lets you download the current settings of the radio, modify them easily using the PC’s big screen and keyboard, and then upload them back to the radio. It’s already nice, I think, that the GX6000 already allows you custom configure the Soft Keys, Channel Names, and more, but that’s all much easier with the PC software. And it could be terrific for, say, a fleet manager setting up multiple radios optimized for particular boating tasks. And similar software is available for the existing HX870 handheld and the brand new HX890. 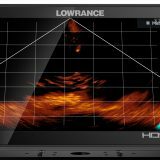 I have not seen any publicity about them, but the HX890 Handheld VHF/GPS and the HX40 Ultra Compact Handheld are not only detailed at StandardHorizon.com but in stock at various outlets for about $270 and $170 respectively. The new feature I really like is that both can be tuned to the FM broadcast band. 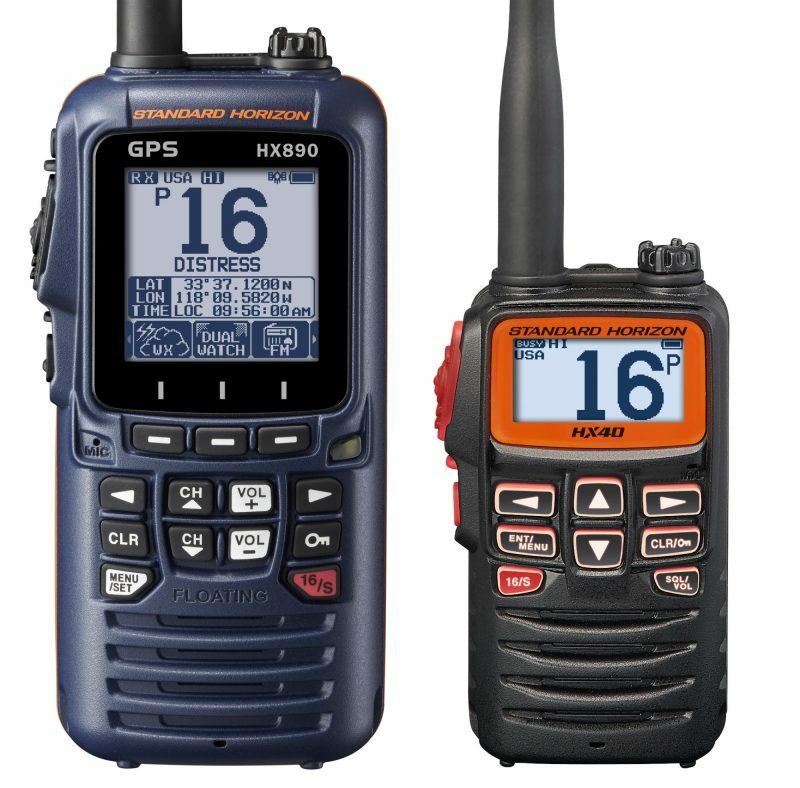 While that means you’re no longer monitoring the VHF band, you can sweep the FM band for available stations which you can save as presets, and even the little (and long gone) SH HX471S I still have sounds pretty good, especially for news and/or talk radio when, say, you’re on a project up the mast. PS 12/17/2018: According to John Sherman in an informative comment below, the new HX890 does not support some useful features — like transmitting a DSC Position Request, or All Ships Urgency and Safety messages — that were available in previous Standard Horizon models like the HX870 and HX851. That AIS target screen reminds me of all the boats that have improperly programmed AIS transponders. The USCG has a handy Encoding Guide https://www.navcen.uscg.gov/pdf/AIS/AISGuide.pdf. The most obvious is the entry for “S/Y ANGEL”. Names should not include vessel type precursors, e.g. F/V, M/V, MV, OSV, P/V, REC, S/V, T/B; except public vessels, e.g. CG, CBP, USN, LAPD, NYFD, WSF. Because AIS has specific field for vessel type including it in the name is not necessary. It’s up to the client/receiver display to properly distinguish the targets with labels, flags, colors or other distinguishing marks. Guilty as charged, Kai, but let’s discuss. First of all, I’ve yet to hear of the Coast Guard asking any M/V, S/Y, F/V etc. to clean up its AIS name, and it wouldn’t be hard to do. One thing I’m doing by voluntarily using a Class B AIS is to make my vessel and personal contact info easily available to the authorities, and I’m happy to do so as I think it can help them keep things safe and orderly. Second, I think that having S/Y, F/V etc. in vessel names actually helps situational awareness, as vessel names are usually easier to see than the other details (which do of course include types like sailing, pleasure, fishing etc.). Then again some displays, like Raymarine’s, can optionally use target icons that reference the Vessel Type, though I don’t think that’s allowed on type approved displays. I don’t have such ambivalence about any other aspect of the encoding guide you linked to, which, incidentally, seems pretty strongly aimed at commercial shipping using Class A AIS. And it’s great that valuable Class A data points like Destination and Navigation Status are accurate for many more vessels than they used to be. I think it’s great you transmit AIS. Thanks to everyone that does! Slightly misconfigured AIS is way better than no AIS at all! I appreciate AIS enough that I’m a mobile AIS to internet relay station for AIS Hub, Marine Traffic and others. 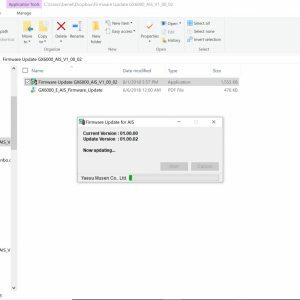 I found a tool https://www.navcen.uscg.gov/aisSearch/index.php that will allow you to search AIS records and give a notice of errors found in the configuration. Interestingly the tool says a value of 0 for antenna position is incorrect. I’ll have to investigate if it’s assumption of a NULL value instead of an actual 0 value. What’s one to do if the antenna is mounted on the stern quarter? If I’m making a DSC transmission to Angel and wish to search in a long alphabetical list of AIS targets I do not necessarily think to look in the “S” section. I’ve seen pilot software like SEAiq use little colored flags to distinguish the moving triangles. I’d like to see vendors spend more effort on making AIS display more useful. B&G/Simrad plotters don’t even have an option to display the name next to the triangle on chart view. “I’m a mobile AIS to internet relay station” — good man! What is your relay setup? I’m currently very happy with the FloatHub I wrote about recently. Do you know is it possible to program the following channel as we use in Europe for the motorboat channel. Frequency 155,500 & 155,525.. through software yce08. when I want to order one gx6000 from usa. Sorry, Kristoffer, I do not recall seeing anything about changing frequencies in the yce08 software, and I doubt the GX6000 can do it. I recently acquired a new “Class H” Standard Horizon HX890 handheld VHF/DSC radio. On its website, Standard Horizon originally stated “…The new HX890 shares all the same capabilities of the extremely popular (Class D) HX870, with the addition of some great new features….” On those assurances I bought the HX890, believing that it represented the most up-to-date set of features and performance. I was disappointed to discover that the HX890 does not support transmitting a DSC Position Request nor does it support transmitting All Ships Urgency and Safety messages. The HX870 and the earlier HX851 support both of these functions. To be fair, the HX890 manual does not describe either of these functions. However, it does describe support of “Auto POS Polling”–automatic polling a “fleet” of other vessels (positions), yet my testing shows that Auto POS Polling does not work. This would be reasonable insofar that auto polling would seem to require the periodic transmission of a DSC Position Request to each of the vessels in the “fleet”. As a result, support of the Group Monitor (GM) function, also described in the HX890 manual, does not appear to work either since it incorporates Auto POS Polling. I have confirmed that Auto POS Polling works successfully on the HX870, and it is a supported feature of my fixed mount GX2150 VHF. Personally, I cannot fathom any practical reason why support of a routine DSC Position Request compromises the utility of the radio for emergency communication (the prime objective of the ITU) or significantly affects its complexity or usability. But to be required to remove practical features with respect to “Routine” DSC calls (as opposed to “Emergency” calls) in order to gain type-approval seems counterproductive. To complicate matters further, a review of the owner’s manual of the ICOM M93D (a VHF/DSC Class D handheld) shows that it (like the Class H HX890) does NOT support transmitting a DSC Position Request function nor does it support transmitting All Ships Urgency and Safety messages. So achieving Class D type approval does not guarantee the presence of these functions. It is difficult for a casual reader to extract concise information from the ITU document on the practical differences between Class D and Class H, but it appears that Class H is a step backward from Class D in certain respects. It is also evident that the functions afforded by Class D transceivers can differ significantly between manufacturers. Caveat emptor. 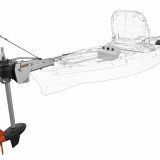 In my experience, Standard Horizon produces excellent products for the recreational boater. But for my money, I am returning the HX890 in exchange for the richer functionality of an HX870. Well, I made a mistake. The Auto POS Polling function does work on the HX890. But despite the same name and a nearly identical description of “Auto POS Polling” in my GX2150 and HX890 manuals, the actual function invoked is much different. Unlike the HX890, my venerable GX2150 supports DSC Position Request, and the Auto POS Polling function evidently transmits periodic Position Requests to each member of a small (up to 4 vessel) fleet whose IDs are selected from the Individual Directory. Upon receipt of a DSC Position Request, the polled station sends a DSC Position Reply message–assuming that the polled station is configured to automatically respond to a Position Request call (default), or if the operator at the polled station explicitly accepts the request and transmits a reply. Each incoming POS Reply message is then displayed and duly recorded in the RX OTHER Log of the GX2150. It takes a while for the POS Reply messages to come rolling in from the polled stations. But if the polled stations support automatic Position Reply, it is a peaceful and unobtrusive method to track your “buddy boats”–no attention or intervention is required of the vessels tracked. The Auto POS Polling function on the new Class H HX890 handheld is much different. The HX890 does not support the POS Request function. As a result, it cannot “poll” the fleet to elicit their positions. Instead, it repeatedly transmits a POS Report (Safety Class) message to each of the “polled” stations reporting YOUR position to all of the other vessels, but not their positions to you. If their radios have not been configured to silence incoming POS Report messages (probably not a good idea for Safety messages), the radio of each of the polled stations rings off the hook until the message is acknowledged by the operator. A few minutes later, their radio is ringing off the hook again. And then again. And again. In practice, the Auto POS Polling function on the HX890 should be called “Harass Your Fellow Boaters Mercilessly”. Like GX2150, no transmitted messages are recorded in the TX Log. But unlike the GX2150, the HX890 receives nothing back from the polled vessels, so nothing is recorded in the RX Log either. In fact, except for an unobtrusive “A” icon on the display, it’s sometimes difficult to tell if the function is working or not. Unless you’re in range to hear the howls of outrage emanating from your (former) “buddy boats”. Ben, it seems that the link to the ITU document you referenced above is no longer good. John, thank you so much for highlighting these critical differences between DSC Class D and Class H radios. I too just bought a new “Class H” Standard Horizon HX890 handheld VHF/DSC radio. I was shopping for a HX870 and got sucked in by the higher model number and the “NEW” label on the vendor’s website. And hey, Class H must be better than Class D. I own several SH radios, they are good products. In my haste I assumed (I admit, not usually a wise approach) that Class H meant new DSC capabilities. When I got the radio and went on-line to research the specifics of Class D vs. Class H (the manual was of no help) I came upon this thread and a similar thread at ContinousWave, and topics at navcen.uscg, etc. Only to learn that Class H was meant to be a “simplified” type of DSC radio for the general boating public. Doh.  Is Class H a solution in search of a problem? After reading what I could on the topic of POS Request/Reply capabilities in Class D vs. H, I can’t figure out if the differences in the HX870 and the HX890 POS capabilities were dictated by the ITU or if they were SH design decisions. Regardless, I’m having a hard time understanding why a DSC radio would change the way POS Request/Reply works, or why all classes wouldn’t support it in some way. Now that the water has been muddied, it would seem that some public education is needed to support appropriate radio selection (to help us hapless souls who don’t read ITU standards for entertainment). Would SH marketing please step up. KC, Thanks for the link to the handy USCG AIS encoding guide! Cruising around Puget Sound I see sooo many blank or misset fields in AIS target info screens. 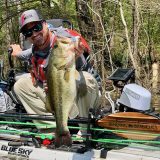 Everyone should read and check your AIS set up. Mic, thanks for the kind words. As it happens, I did return my HX890 for an earlier HX870 and am much happier with the richer functionality provided. 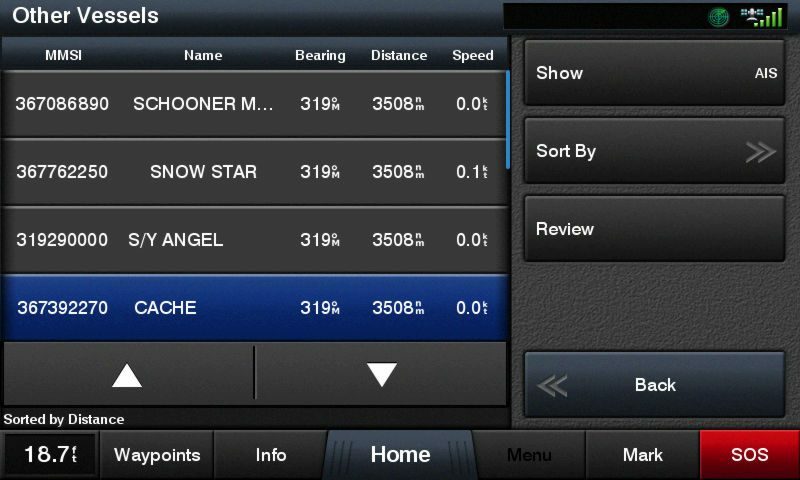 Not only can you Auto POS Poll an additional 3 vessels (7 instead of 4), you can elect to poll by either soliciting an unobtrusive POS Request from each of the polled vessels OR you can go the HX890 route and mercilessly harass your fellow boaters by blasting out successive POS Report(s) to each of them.